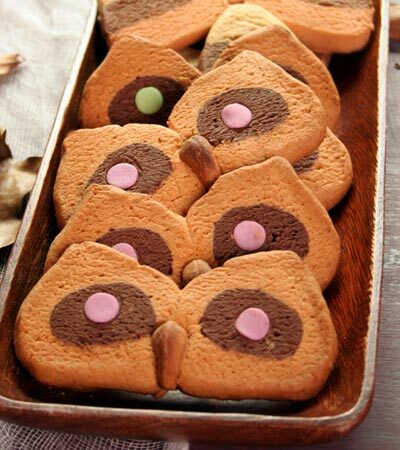 Totally adorable hoot owl cookies! These cookies are not an incredibly sweet cookie. Very much like a shortbread. The perfect cookie to drink hot cocoa with because the flavors won't compete. Want to know what others thought about this recipe? Would you like to comment on this recipe? Go to the Hoot Owl Cookies blog entry. With an electric mixer cream together sugar, brown sugar, shortening, butter and ground flax. Add vanilla, water and maple syrup and mix together. Slowly add flour, baking powder and soda and salt. Split 1/3 of the dough and place back into mixing bowl and add cocoa powder and incorporate into dough. Take the remaining 2/3 of the dough and incorporate 6 drops each of red and yellow food coloring. To shape the cookies roll orange dough out onto a floured surface, shaping it into a rectangle that is 11 inch wide and 6 1/2 inches in heights. Roll the chocolate dough into a an 11 inch dowel. Place that in the middle of the orange rectangle. Bring the ends up and join them together making a tear drop shape with a flat bottom. cover in plastic wrap and place on a cookie sheet and let chill in the fridge for at least 5 hours. After the dough has chilled, slice off the very ends of the dough to create a flat surface to start slicing. Keep the ends, we are going to use them to check for done-ness. Slice into about 3/8 inch slices. 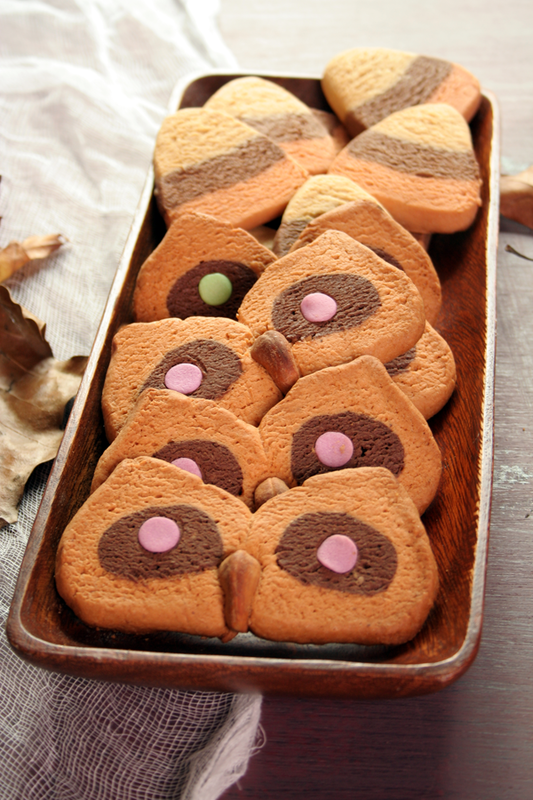 Place them on a cookie sheet butting the sides together of 2 slices to form the owl shape. With your hands move the ears over further towards the side with your hand and adjust the bottom by rounding it more. Place a whole cashew in the middle for the nose and 2 jumbo confetti sprinkles for the eyes. This cookie dough can also be shaped into candy corns. Just third the dough up. Add 1/2 Tablespoon of cocoa powder to one third, 3 drops yellow, 3 drops red food coloring to another. Leave the other plain. Roll them into 11 inch dowels. Place them on top of each other. Place the plain on top and chocolate on the bottom. Shape the sides into a pyramid with a rounded top with your hand. After they are out of the oven, let them cool completely before you take them off the cookie sheet.